Sarah Silverman is an American comedian with an interesting suggestion on how to solve world hunger. Sell the Vatican. 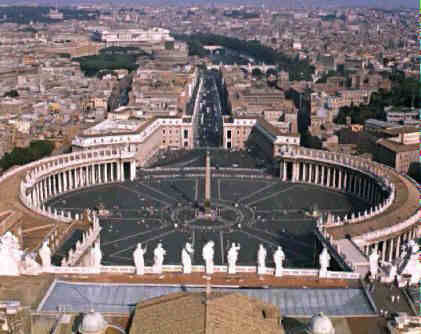 The Roman Catholic Church have a lot of property and possessions that would be worth a fair bit of money. Is this a valid suggestion? What is the Church’s responsibility in managing resources and looking after the poor? There are a lot of things Christians could be spending money on. And in some regards it’s easy to say sell up everything and give it away. That’s what Jesus would have done, isn’t it? But what about spending money on property so that there’s a building where you can go hear about God? What about printing and distributing Bibles so that people can read what God has to say to them? How do you decide where you spend your money? How do you balance the tension between social concern and investing in the gospel?